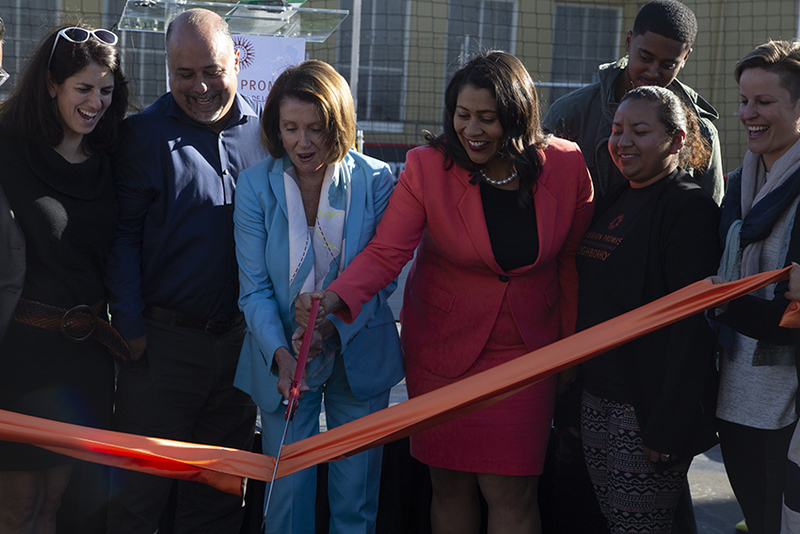 Mayor London Breed, flanked by House Minority Leader Nancy Pelosi and others including Supervisor Ronen at a ribbon cutting ceremony at Horace Mann Buena Vista’s new soccer field. Photo by Abraham Rodriguez. A full cast of San Francisco dignitaries made its way onto a makeshift stage at Buena Vista Horace Mann K-8 on Wednesday to christen a $6 million federal grant given to a program that would help Mission District students make it to college. Those dignitaries: Rep. Nancy Pelosi, Mayor London Breed, Supervisor Hillary Ronen, and School Board Commissioner Mark Sanchez. The program: Mission Promise Neighborhoods, which, as Mission Local reported in July, was re-infused with a two-year $6 million grant from the U.S. Department of Education. The Mission Economic Development Agency originally received a five-year, $30 million grant for the program in 2012. Despite the sharp reduction of funds, the program has expanded from an original four schools to nine, including Bryant and Cesar Chavez elementary schools, Everett Middle School, John O’Connell High School, James Lick Middle School, Buena Vista Horace Mann K-8, Flynn Elementary, Sanchez Elementary and Mission High School. Richard Raya, the director of the program, said they will be partnering with various neighborhood nonprofits to connect families to housing, jobs, healthcare and legal services — all in an effort to help students succeed academically. The new funding, he said, was far from a sure thing before it received the grant in July. “We were at risk of losing this important community infrastructure at a time we needed it most,” he said. But Pelosi, after taking the stage, said the program’s success earned it another grant. “The example you set here [in the Mission] is why we were able to get additional funding,” Pelosi said as screaming kids ran around the playground and swung on the jungle gym. Breed explained her own difficulties in middle school and repeated a story she told Mission Local last month about how her middle school band teacher gave extra time to help her sit in the first chair of the French horn section. Ronen, who represents the Mission, said that before Mission Promise Neighborhoods, the Mission had seven of the 10 lowest-performing schools in the city. “In comes Promise Neighborhoods,” she said, mentioning the wrap-around services the program provided to not only students, but their families. One of those students is Julian Nelson, who told the audience that he graduated from John O’Connell High School in three years and now is attending San Francisco State University on a full-ride scholarship. He said he owned some of his success to Mission Graduates, a partner of Mission Promise Neighborhoods.